There’s nothing like the great outdoors. There are all kinds of physical and mental health benefits garnered from spending time outside connecting with nature (of course, that’s if we can manage to put away our gadgets long enough to venture out). The United States alone has a whopping 59 national parks, so it might be a bit difficult figuring out where to start. Rather than frantically hitting up Google, read our comprehensive list of the best national parks in the USA below. 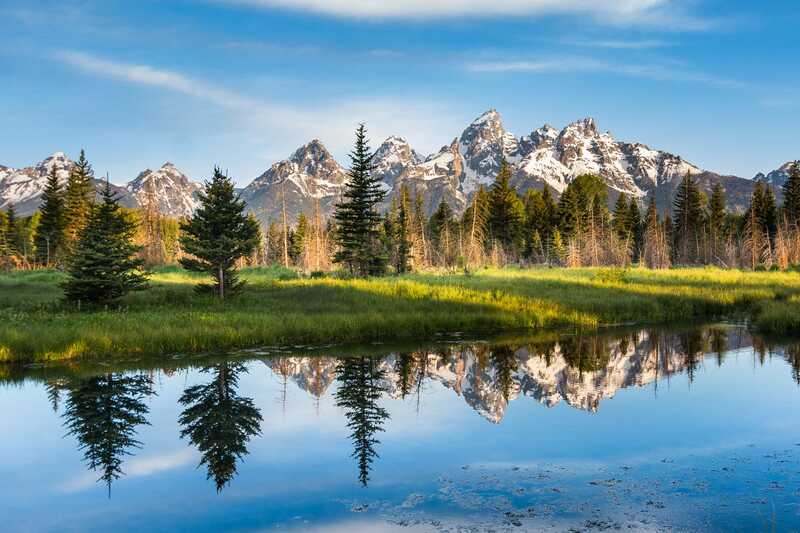 Rising above a scene rich with extraordinary wildlife, pristine lakes, and high mountainous terrain, the Teton Range is a majestic monument to those who fought to protect it. The park’s cultural history extends back more than 10,000 years when Paleo-Indians first roamed the valleys of the park. Today you can explore Grand Teton National Park’s trails, float on the Snake River, or make a splash in any of its lakes. 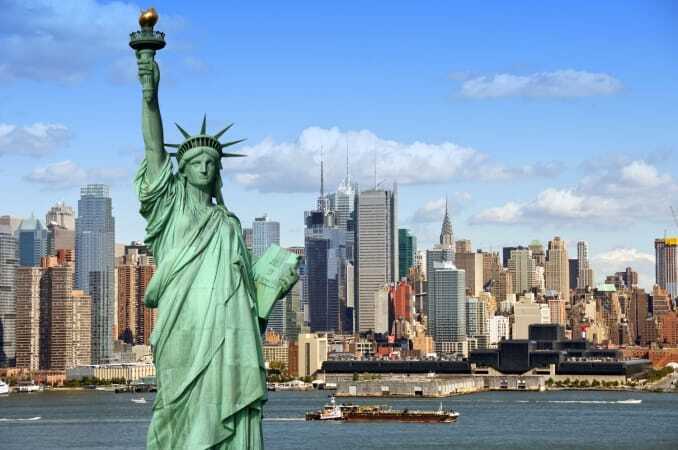 Viewing the wildlife, hiking, camping, or settling in for some quiet time while bird watching are also popular activities to create great memories in one of the most famous national parks in America. World renowned for its diversity of plant and animal life, its mountains, and the quality of its remnants of Southern Appalachian culture, Great Smoky Mountains National Park is one of the most beautiful national parks in the USA. Great Smoky Mountains National Park is also America’s most visited national park, receiving millions of recreational visitors annually. The park sits on over 500,000 acres of land and is one of the largest protected areas in America. Great Smoky Mountains National Park is steeped in a rich culture and history, and it possesses immense natural beauty and a host of activities to participate in all year round. During winter, the absence of deciduous leaves reveals stone walls, chimneys, foundations, and other reminders of residents past. Springtime brings blooming wildflowers and flowering trees, and summertime park visitors hike along mountain trails and cool down in the shade. For amazing summertime views, follow the mountain streams to roaring, cascading waterfalls. Autumn hikers can relish the crisp air and the colours of fall as they enjoy a number of different trails, the beautiful scenery, rocky bluffs, and foliage. 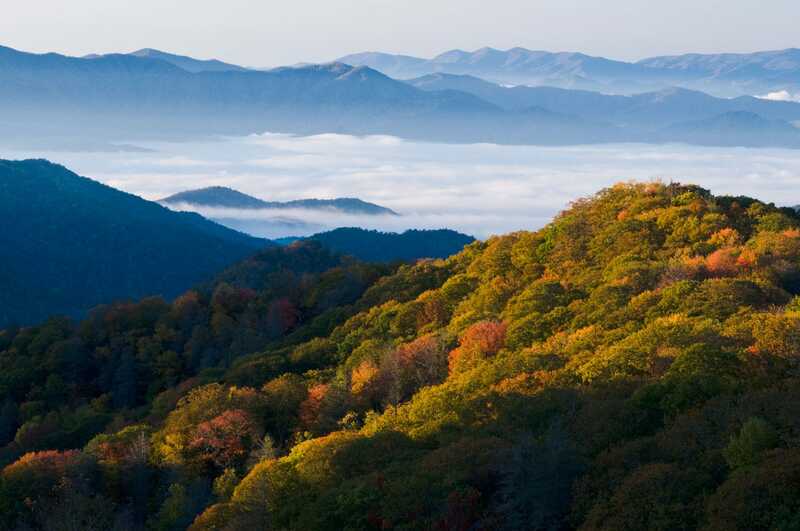 No matter when you visit Great Smoky Mountains National Park, you’re in for a real treat. Unique combinations of geologic color and erosional forms decorate this impressively massive canyon that is 446 km long, up to 29 km wide, and a mile deep. Beyond its scenic overlooks, this immensely large geologic wonder features hikes, mule rides, and rafting. 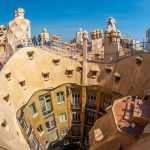 Go on a helicopter aerial tour of the park, or ride around in style in an open jeep or on the free shuttle bus as you savor all the magnificent sights. 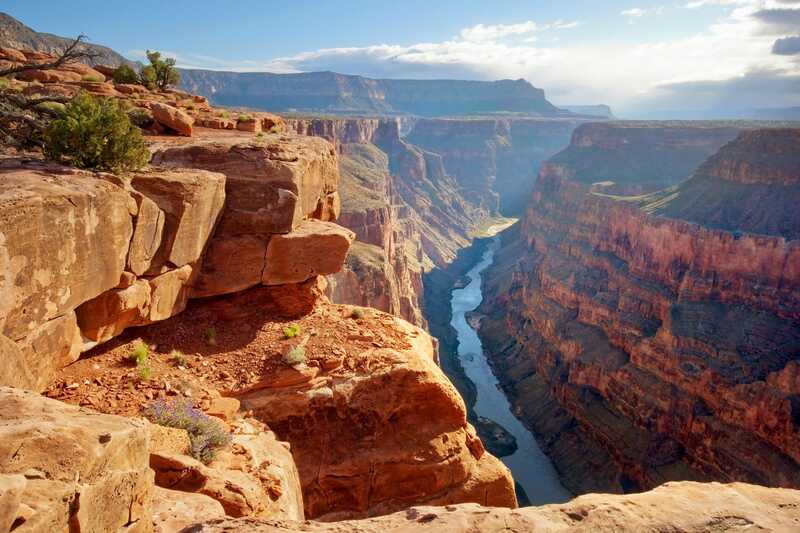 The vastness of the Grand Canyon is absolutely extraordinary, and continuously guarantees it a spot as one of the best American national parks. 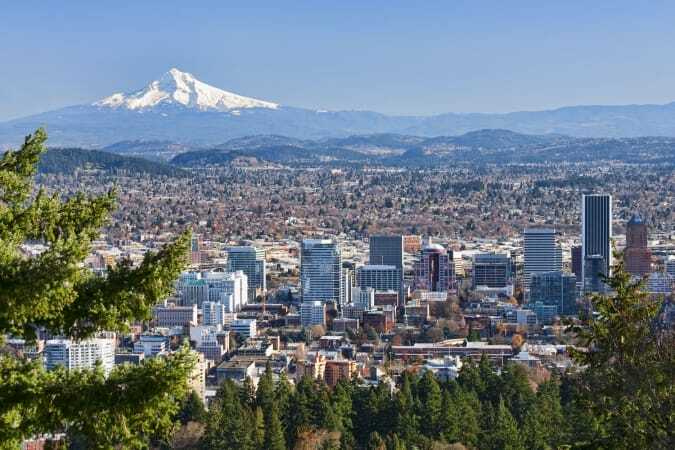 Volcanoes are powerful reminders that planet Earth is ever-changing and dynamic, with all kinds of forces and processes at work that we can’t control. A trip to Hawai’i Volcanoes National Park is an unforgettable, intriguing treat for nature-lovers with an adventurous streak. Hawaiʻi Volcanoes National Park is both an international biosphere reserve and a World Heritage Site, with over 150 miles of trails that offer lush rain forests, desert landscapes, and breathtaking volcanic scenery courtesy of the park’s active volcanoes. Park visitors may choose to explore volcanic summits and calderas, go cycling, camp out, hike, or take guided historical tours. 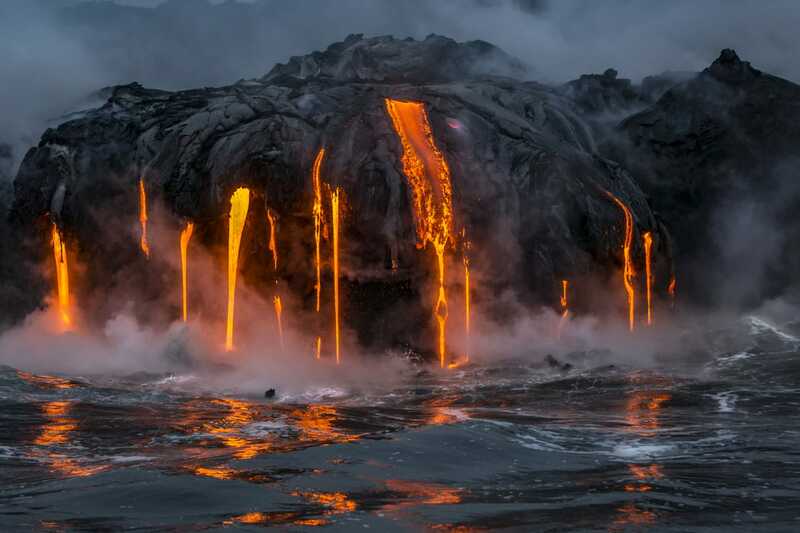 Hawai’i Volcanoes National Park is without a doubt one of the best national parks in America. Visit Yellowstone and experience the world’s first ever national park. 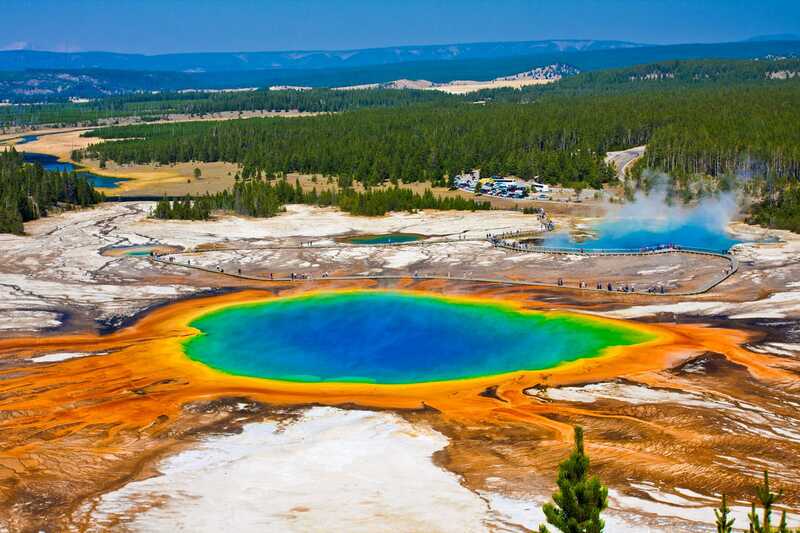 Marvel at the Yellowstone Supervolcano and its hot springs, mudpots, and geysers. 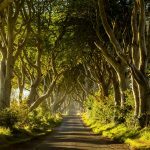 Witness the drama of the natural world unfold as you explore mountains and forests, while gazing at tons wildlife along the way. Yellowstone National Park’s 2 million acres house majestic peaks and abundant wildlife, as well as the world’s largest concentration of geysers and thermal features. As one of the most beautiful national parks in the USA, many of Yellowstone’s features have been immortalized and made famous through photographs and paintings. Delight in a hike, watch the sunset, go boating, skiing, snowshoeing, cycling, or simply bask in awe of iconic sites like Old Faithful and Lower Falls. 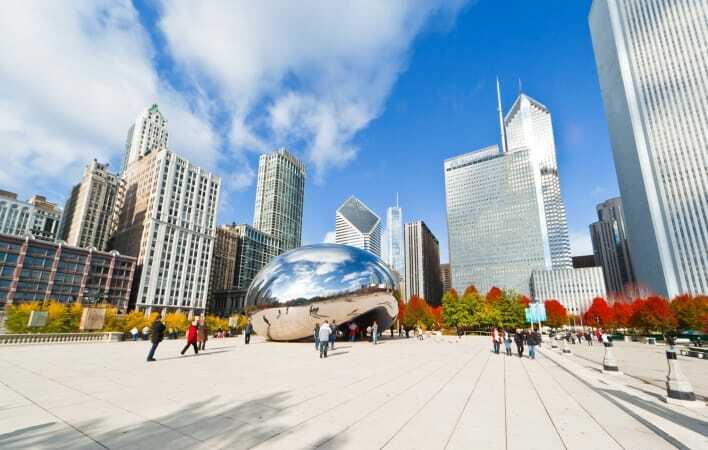 The sights combined with the history of the park make it a perfect destination for a lovely vacation. Hot and sunny canyons, rugged foothills, majestic mountains with cold alpine peaks, vast caverns, and groves of giant sequoia trees are just a few parts of Sequoia National Park’s dramatic landscape. Often dubbed ‘Mother Nature’s skyscrapers’, giant sequoias are some of the largest and oldest organisms on the planet. 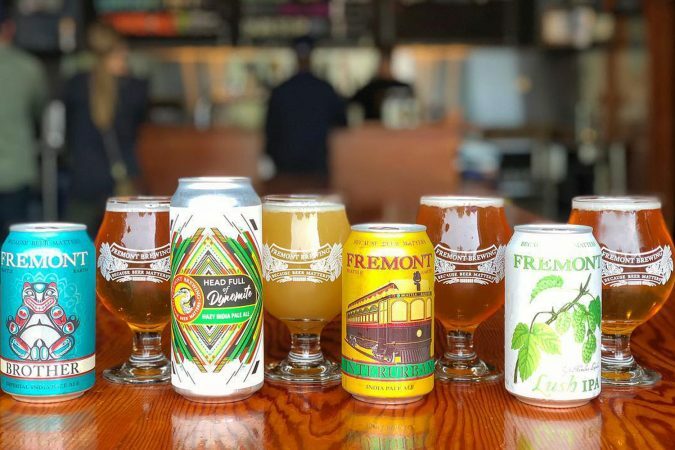 You’ll find them nestled in a small pocket on the western slopes of California’s Sierra Nevada mountain range in Sequoia National Park. The park’s largest and finest groves of giant sequoias grow at the sometimes snowy mid-elevations, along with extraordinarily diverse plants and animals living in varied conditions. 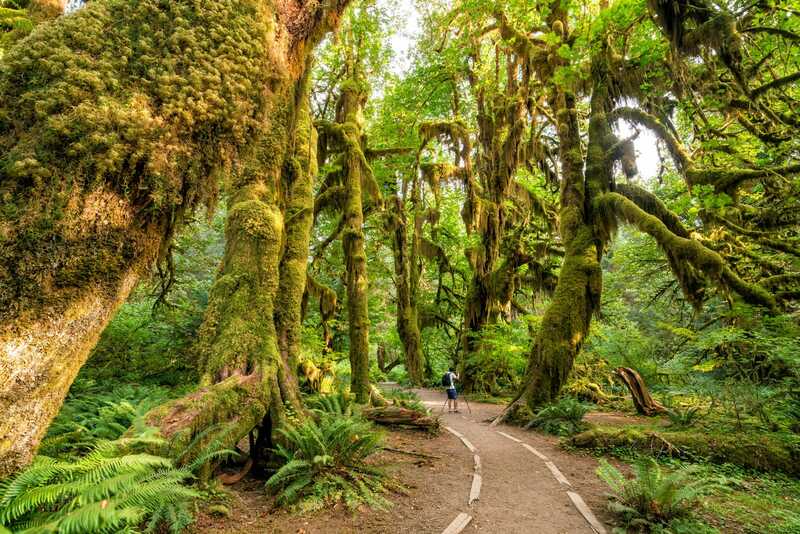 Take a walk in the Giant Forest, which contains five out of the ten largest trees in the world. Travel steep highways and ascend into cool forests and sequoia groves as you experience the wild side of the Sierra Nevada mountain range. Explore the park’s 404,064 acres of preserved landscape that still greatly resembles the southern Sierra Nevada before Euro-American settlement. 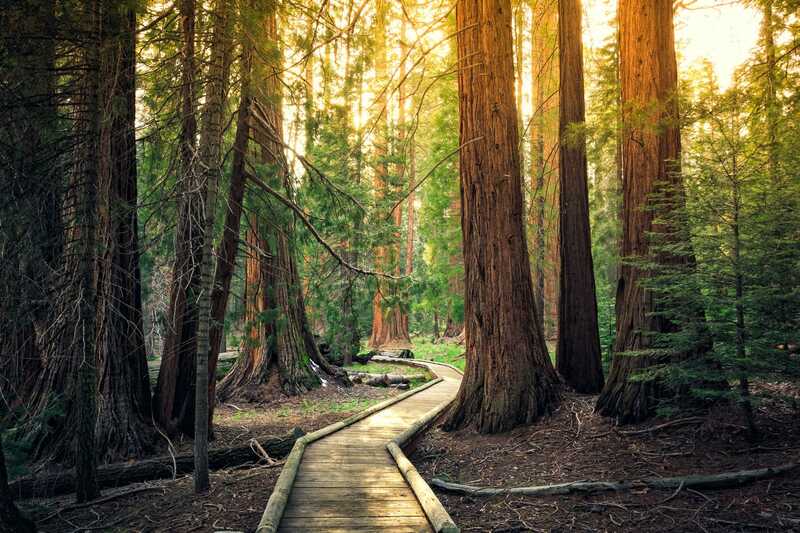 With all that it has to offer, there’s no wonder why Sequoia National Park attracts over one million visitors a year. 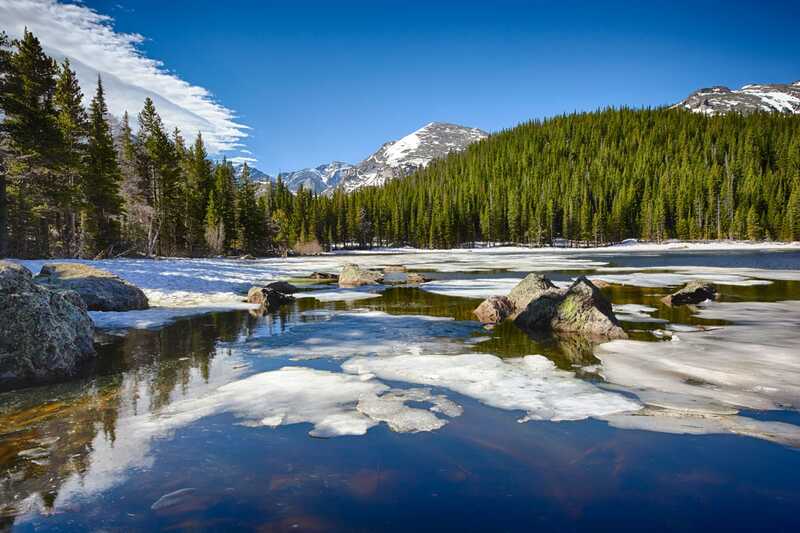 Rocky Mountain National Park’s 415 square miles encompasses and protects spectacular mountain environments. Enjoy Trail Ridge Road (the highest paved road in the US) and its overlooks, as well as over 350 miles of trails, woodlands, tundra wildflowers, and abundant wildlife. Choose from flat easy hikes around a mountain lake to challenging backpack trips and climbs. Rocky Mountain National Park is an UNESCO World biosphere reserve, and one of the most visited national parks in the country. With more than 100 majestic peaks rising thousands of feet in altitude and sheltered valleys dotted with roaming wildlife, the park offers stunning vistas accessible by horseback, on foot, or by car, and an incredible adventure. Boasting some of the best scenery in the world, Rocky Mountain National Park is a hiker’s paradise. More than a pretty valley or a collection of waterfalls, Yosemite National Park is a monument to the strength and power of granite rocks and glaciers, the persistence of life, and the tranquility of the High Sierra. Though well-known for its waterfalls, Yosemite also boasts nearly 1,200 square miles of forests, deep valleys, beautiful meadows, and ancient giant sequoias. 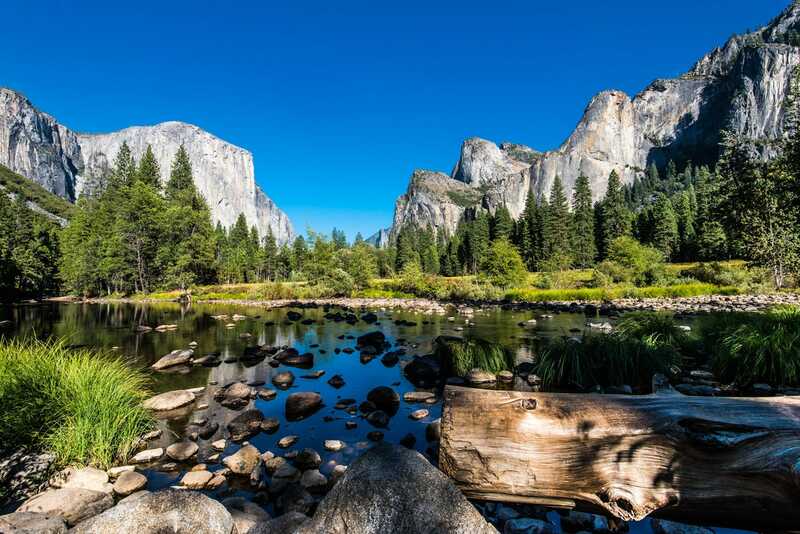 Yosemite Park has been a national treasure for over 125 years. Centuries of glaciers grinding over and through granite rock have created spectacular mountains and valleys in the Sierra Nevada. At Yosemite, giant sequoias stand in striking contrast to the vibrant blue lakes and gray-white rocks. Over 95% of Yosemite National Park is designated wilderness; take the path less trod and go backpacking through the miles of pristine terrain. 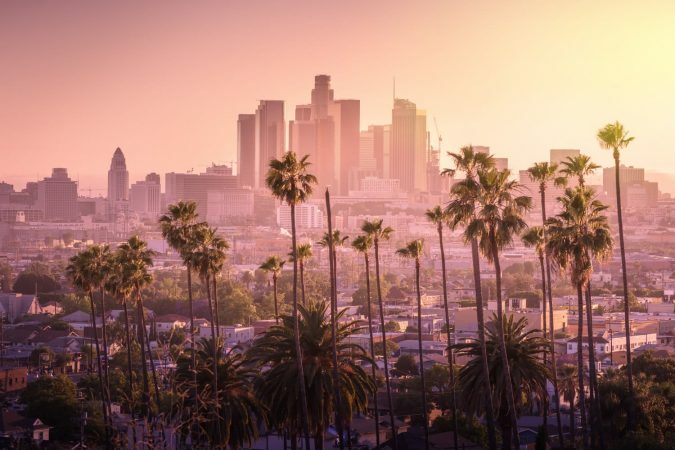 Explore hundreds of miles of trails on foot or horseback, wander through the Mariposa Grove of Giant Sequoias, go for a scenic drive on Tioga Road, or visit Yosemite’s most photographed spot – the Half Dome. No matter how you choose to explore Yosemite National Park, you’re in for an amazing experience. Mount Rainier National Park was established in 1899 as America’s fifth national park. Ascending to 14,410 feet above sea level, Mount Rainier rises abruptly from the surrounding land and spawns six major rivers, making Mount Rainier stand out in American landscape as the most glaciated peak in the contiguous US. Wildlife abounds in the park’s ecosystems that encompass 236,381 acres of land. 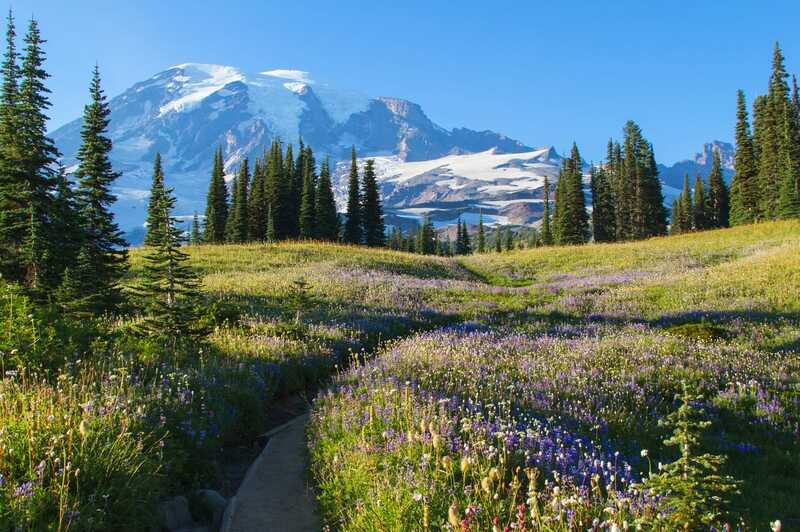 Subalpine wildflower meadows form a ring around the volcanic mountain for which the park is named, while ancient forest, valleys, waterfalls, subalpine meadows, and more than 25 glaciers surround Mount Rainier’s lower slopes. 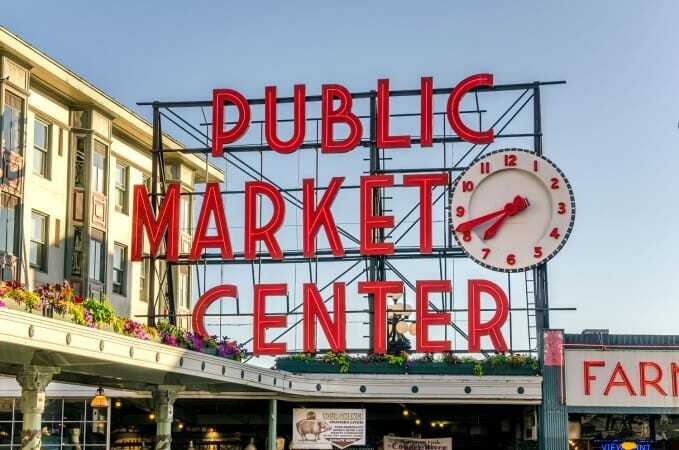 You don’t want to pass up a chance to visit the most gorgeous wonder in the Pacific Northwest. 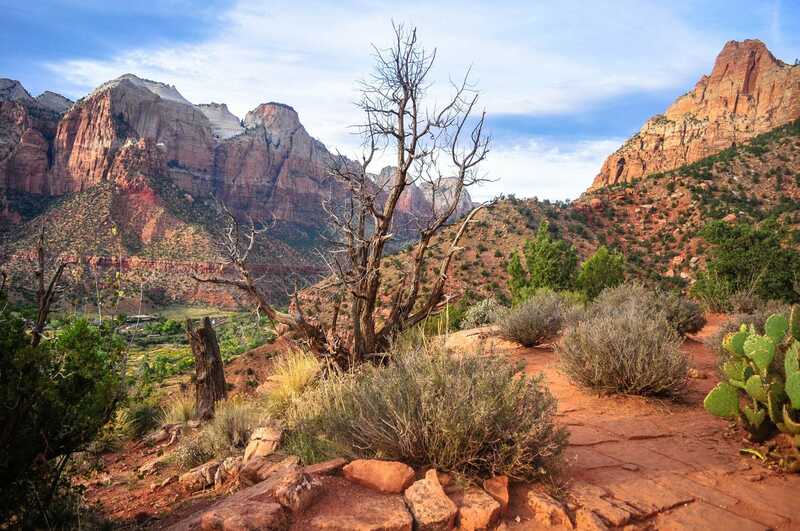 Zion is the oldest, most visited national park in Utah with over 3 million visitors annually. Follow the paths where ancient native people and pioneers walked, gaze at massive sandstone cliffs of cream, pink, and red that soar into a brilliant blue sky, and experience wilderness in a narrow slot canyon. Zion means ‘heavenly city’, and though there are no churches in Zion National Park, Zion’s beauty has been known to inspire reverence. Zion National Park displays the oldest geologic layers that side of the Grand Canyon, a dozen desert waterfalls, and it boasts a unique array of plants and animals. Absorb the rich history of the past and enjoy exciting adventures as you walk along the serrated mountain ridge of Angels Landing, stroll alongside beautiful emerald pools of water, or explore the crosshatch of canyons scratched into Zion National Park’s landscape that make for numerous trails at varying levels of difficulty. With a gorgeous combination of hikes, waterfalls, and epic views, there’s no wonder why Zion National Park is one of the most popular parks in the country. Encompassing nearly one million acres of land, sheltering wildlife, protecting a vast wilderness, and playing host to several distinct ecosystems, Olympic National Park is a haven for nature lovers. Go rafting, fishing, or kayaking on the park’s rivers or lakes, or if water isn’t your thing, go mountain climbing, backpacking, or watch the stars at night. Enjoy Olympic’s miles of rugged shoreline by exploring trails, camping out, going fishing, or joining one of the ranger-led tours. From its glacier-capped mountains to its temperate rainforests and tide pools, Olympic National Park is as beautiful as it is diverse. Glacier National Park is over 1,000 square miles of wilderness and mountain ranges carved by prehistoric ice rivers located in Montana’s Rocky Mountains. 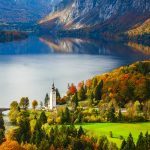 Established as a national park in 1910, it features alpine meadows, deep forests, waterfalls, numerous glistening glaciers, and sparkling lakes. As the ‘Crown of the Continent’, Glacier National Park straddles the US – Canadian border and its waters feed streams that flow to the Pacific Ocean, the Gulf of Mexico, and to Hudson’s Bay. Warm, wet Pacific air and cold dry Arctic air meet at the Continental Divide and battle it out in a clash of climates at Glacier National Park, making for varied and sometimes extreme weather conditions. 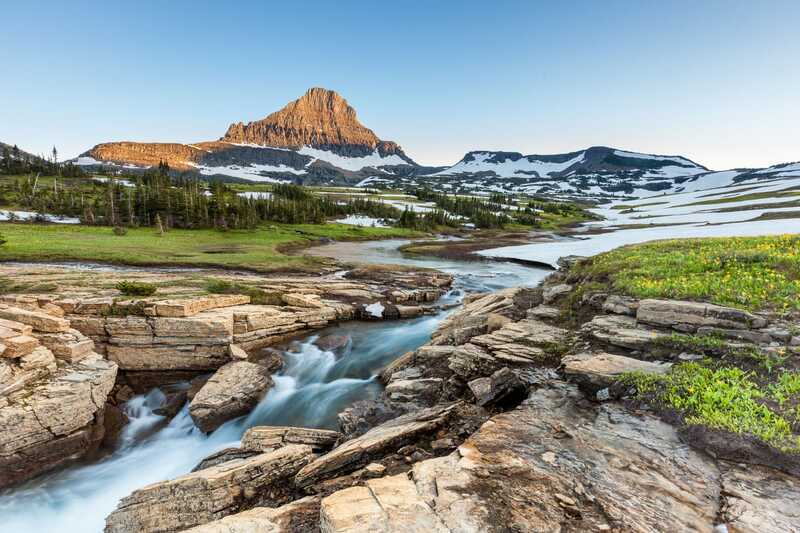 Glacier is straight out of a photographer’s dream with the breathtaking vistas from Going-To-The-Sun Road, the fields of flowers at Logan Past that carpet foothills with different colours, and a multiplicity of tundra flower species, glacier-carved peaks, and valleys. Glacier National Park is a biosphere reserve, a World Heritage Site, and one of the world’s first international peace parks, in addition to being a US National Park. It is the only site in all of America to bear these four significant designations. Relatively few miles of road exist in the park’s 1,600 square miles of picturesque landscape, thus preserving the unspoiled beauty of this national treasure. There’s plenty to do at Glacier – take your pick of boating, backcountry camping, hiking, or simply basking in Glacier’s unparalleled beauty. Spending time in Glacier National Park is what dreams are made of. Established in 1916 by President Wilson as a national monument by the name of Sieur de Monts, Acadia was not named a national park until 1919, and it was only officially named Acadia National Park ten years later in 1929. 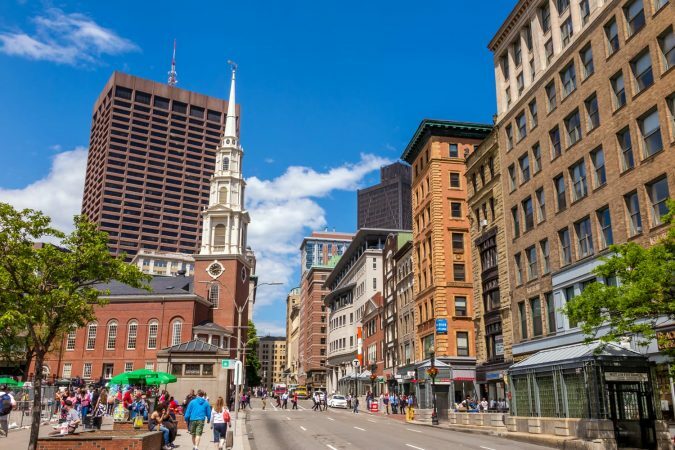 Each year, millions of people visit Maine’s only national park to explore seven peaks above 1,000 feet, 120 miles of hiking trails, 45 miles of carriage roads, 17 stone bridges, and four lighthouses. 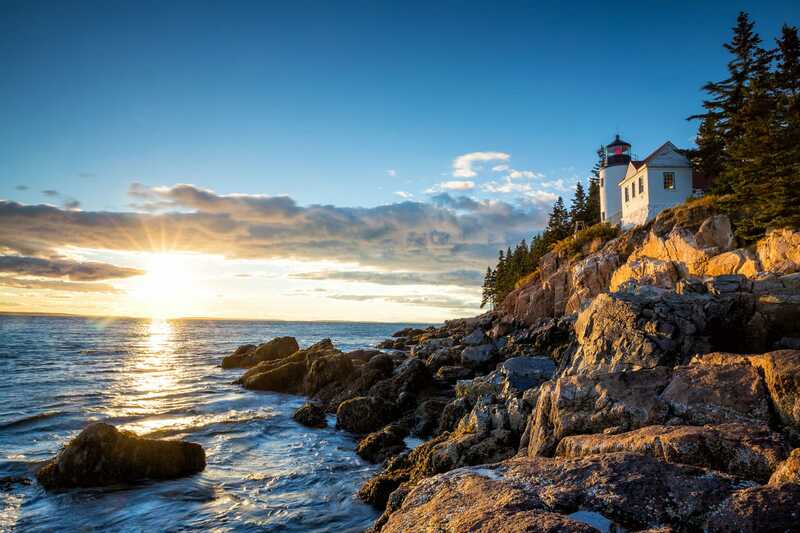 Besides beautiful old stone bridges and rustic lighthouses, Acadia is home to the highest rocky headlands along the Atlantic coastline of the United States. It also houses a number of marshlands and pondsas well as diverse plants and animals. Wander along the ocean shoreline, enjoy bird calls in the stillness, watch shooting stars from one of the mountains, or take a sunset boat ride; Acadia has 47,000 acres of land perfect for exploring! Mammoth Cave National Park is the world’s longest known cave system, a UN World Heritage Site, and part of an international biosphere reserve. Located beneath hills and hollows in central Kentucky, the majority of Mammoth Cave National Park consists of a network of limestone caves beneath the surface. With more than 400 miles explored, this cave’s vast chambers and complex labyrinths have earned the park its name. Notwithstanding all this, new caves are continually being discovered and added to the hundreds of miles already discovered and mapped out. Officially established in the 1900s, Mammoth Cave was discovered much earlier. In fact, the park’s earliest cave guide was a young slave named Stephen Bishop. He explored the cave by flickering limelight before passing away in 1857. After his passing, Bishop was buried in the Old Guide’s Cemetery near the park entrance. In a quote passed down for centuries, Bishop called Mammoth Cave “grand, gloomy, and peculiar”. 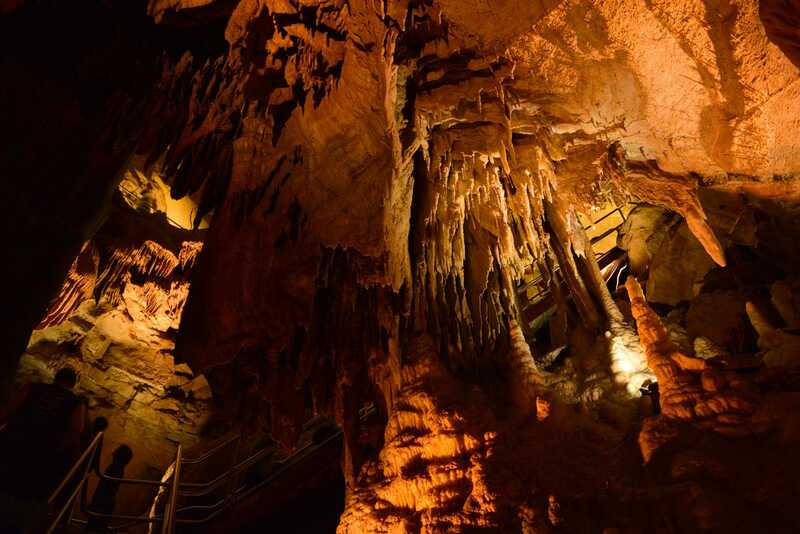 There’s more to Mammoth Cave National Park than just cave explorations. Complete your underground trips with a river trip, a brief stroll, biking, an invigorating hike, or horseback riding. You can also canoe and kayak on Green River and Nolin River. Make sure you book your tours in advance to ensure you have an absolutely unforgettable time at Mammoth Cave National Park. Chaco Culture National Historical Park is a US National Historical Park hosting the densest and most exceptional concentration of pueblos in the American Southwest. 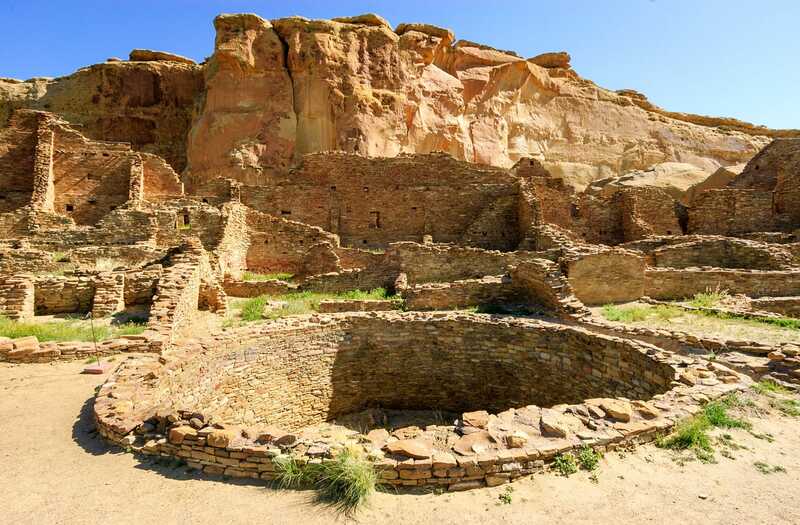 Nestled between Albuquerque and Farmington, Chaco Culture National Historical Park is a sweeping collection of ancient ruins located in a remote canyon cut by the Chaco Wash. The park preserves one of the most important pre-Columbian cultural and historical areas in the US, and attests to the organizational abilities and engineering ingenuity of times past. Today, amidst this ancient landscape, visitors can experience the same dark sky that the Chacoans observed long ago. Chaco has long been considered by stargazers and night sky enthusiasts to be one of the best places in America to stargaze. But despite the fact that the park’s natural nighttime darkness and commitment to reducing light pollution have led to it receiving the honor of being certified as an International Dark Sky Park, Chaco protects its dark night skies for more than just delighting stargazers. Nocturnal wildlife and plants in and around the park rely on the unaltered darkness for survival. By designating over 99% of the park as a ‘natural darkness zone’, in which no permanent outdoor lighting exists, Chaco ensures the preservation of these nocturnal ecosystems with the added benefit of giving stargazers and dark sky enthusiasts quite the treat. Roughly 400,000 fearless travelers journey to Denali National Park and Preserve in Alaska each year. 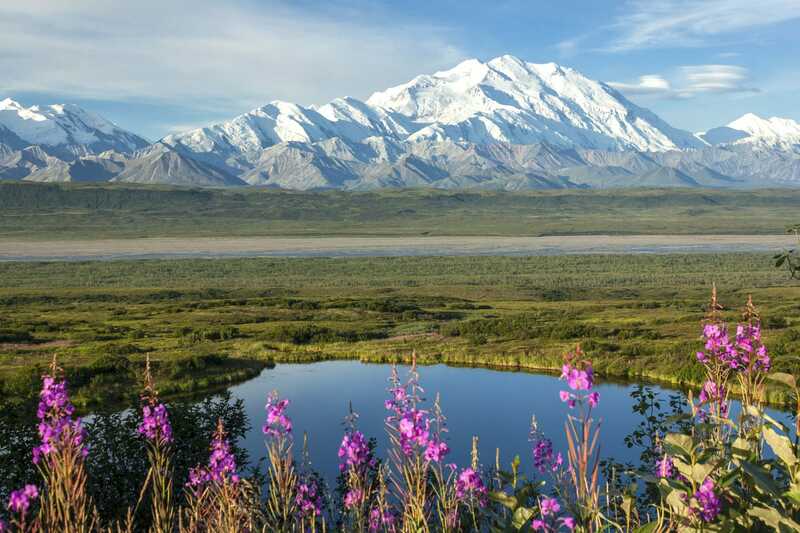 Though most Denali visitors come in the summer season between May and September when the weather is less extreme, there is still plenty to do and see all year. Denali is beautiful in wintertime, the chilled air and piercing wind are invigorating, and the reduced visitor traffic ensures that if the park’s snow covered grounds aren’t reward enough, the solace and tranquility would have made braving the extreme weather worth it. Known around the world for its amazing scenery and wildlife, Denali National Park and Preserve is the perfect place for nature exploration and inspiration whether it’s winter, summer, autumn or spring. There are two ways to hike in Denali: on a marked trail, or off-trail in nearly any direction you choose. Denali National Park and Preserve was established with the vision of primarily providing visitors with a trail-less wilderness experience, and as a result of this there are few marked trails in the park. Talk to a park ranger or check out online resources for tips on self-guided hiking in the park if you’re up to the challenge. Make your own path and make it as challenging as you’d like, or amble along the less than two-mile long marked trails near the park entrance. In addition to the beauty the wilderness offers, you’ll also be face to face with the tallest peak in North America. Denali National Park and Preserve is truly a special place that deserves a visit as soon as you get the chance. Arches National Park is a United States National Park in eastern Utah, It’s adjacent to the Colorado River and consists of thousands of acres of desert land. 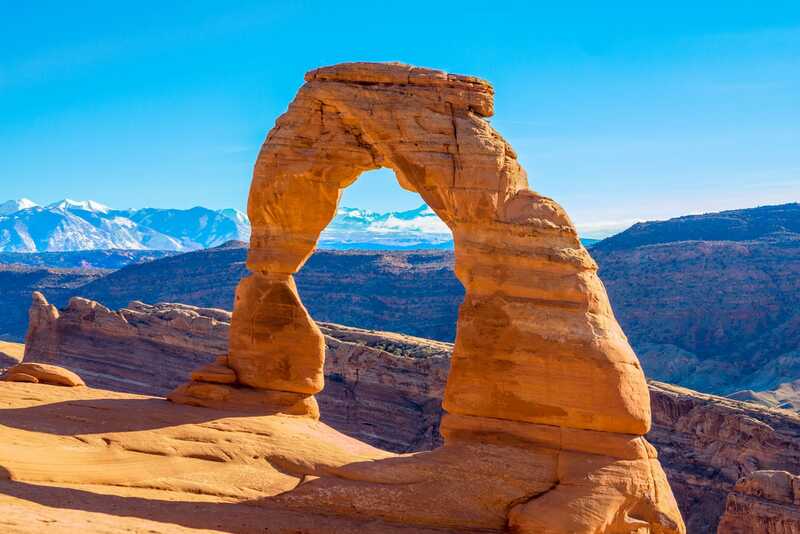 It is home to over 2,000 natural sandstone arches, including the world-famous Delicate Arch, and a variety of unique geological resources and formations. It contains the highest density of natural arches in the world. Arches National Park was designated a national monument in 1929, but it was not until nine years later that the iconic 65 foot orange bluff, Delicate Arch, was officially added as a mapped part of the national monument. And much later still, Arches finally became a national park in 1971. Utah natives are very proud of Arches National Park and often liken God to a stonemason and Arches to a collection of some of the most unique and daring pieces in His workshop. Visit Arches to discover a landscape of contrasting colors, landforms, and textures you’ll find nowhere else in America. Engage in outdoor passions against the backdrop of 2,000 awe-inspiring natural stone arches, hundreds of soaring pinnacles, and giant balanced rocks. This red-rock wonderland amazes with its unique and beautiful formations, refreshes with its numerous hiking trails, and inspires with its fiery sunsets. At the edge of the Kenai Peninsula the ice age lingers. Kenai Fjords National Park is a United States National Park established in 1980, where wildlife thrives and lush forests surround vast expanses of ice. The park covers an area of over 600,000 acres, contains one of the largest ice fields in America, Harding Icefield, and shelters a deeply indented coastline. Nearly 40 glaciers flow from this crowning feature. 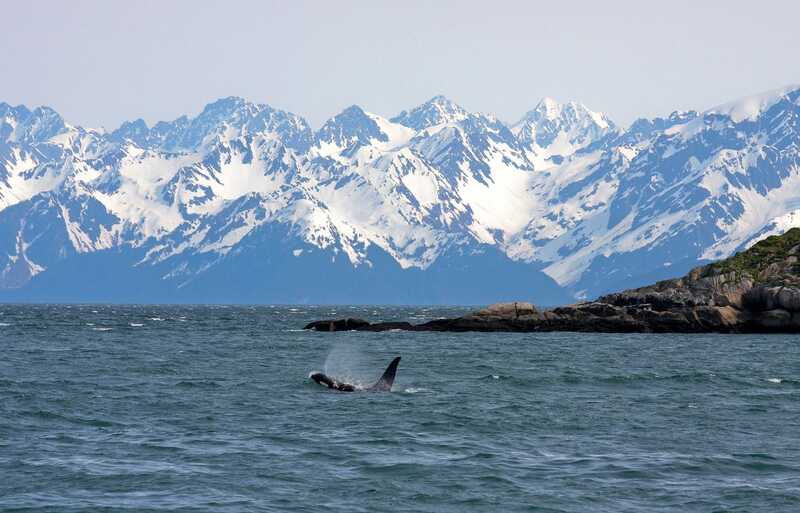 Despite the fact that Kenai Fjords National Park is the smallest national park in Alaska, it is home to a variety of terrestrial and marine mammals, and brings the essence of coastal Alaska into one place. One of the most amazing natural places in southcentral Alaska, Kenai is wild, dynamic, and scenic; rich with glaciers, stormy seas, and fish. Kenai Fjords National Park is the perfect place to explore marine life, go fishing for salmon and halibut, or watch glacier ice tumble into the waters below. Everglades National Park is a World Heritage Site, international biosphere reserve, a Wetland of International Importance, and a specially protected area. 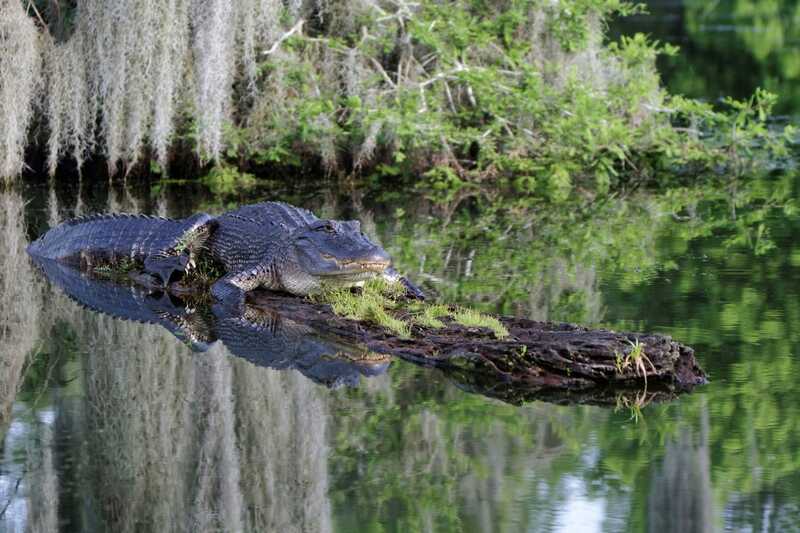 It is one of the largest national parks in the US, and it protects an unparalleled landscape that is the habitat and shelter for a number of rare and endangered species like the manatee, American crocodile, and the Florida panther. Go hiking, kayaking, biking, fishing, or camping, or ditch the traditional and try geocaching – a real-word treasure hunt. Tons of fun awaits at Everglades National Park, one of the most popular national parks on the east coast of the United States. Over time water and wind have eroded the rock in Bryce Canyon National Park to leave behind the world’s largest collection of uniquely shaped, red-orange-pink sandstone pillars called hoodoos. There is no place like Bryce Canyon. Bryce transcends 2,000 feet of elevation, resulting in three distinct climatic zones, and this diversity of habitat provides for high biodiversity. Come to Bryce Canyon National Park and enjoy over 100 species of birds, dozens of mammals, and more than 1,000 plant species. Enjoy blushing sunrises and fiery sunsets as you hike around the park’s 37-mile circuit and watch the canyon and its sandstone pillars come alive. Bask in the arid climate as you’ll be surrounded by layers of colorful rocks. 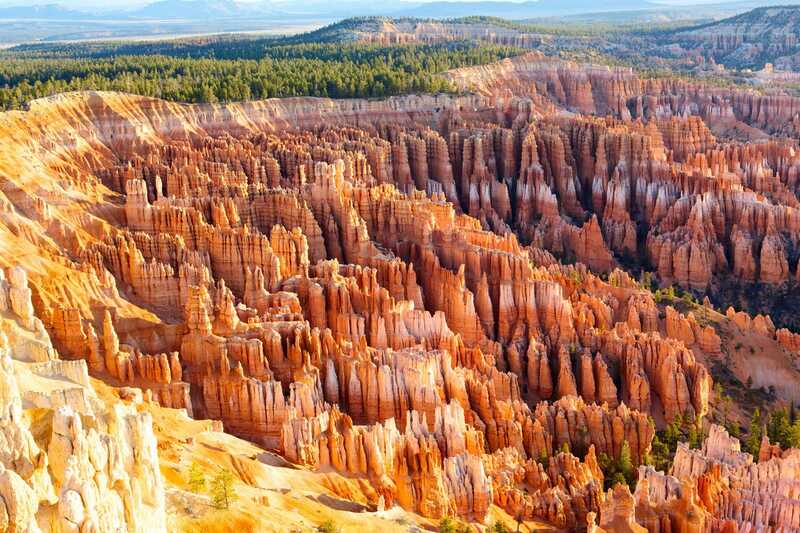 The beauty of Bryce Canyon National Park is truly unmatched. Tucked away between the sprawling cities of Akron and Cleveland is Cuyahoga Valley National Park. Established as a national park in 2000, it’s a refuge for native plants and wildlife, and provides plenty of routes for discovery and exploration for park visitors. The winding Cuyahoga River gives way to deep forests, rolling hills, open farmlands, and secluded trails. 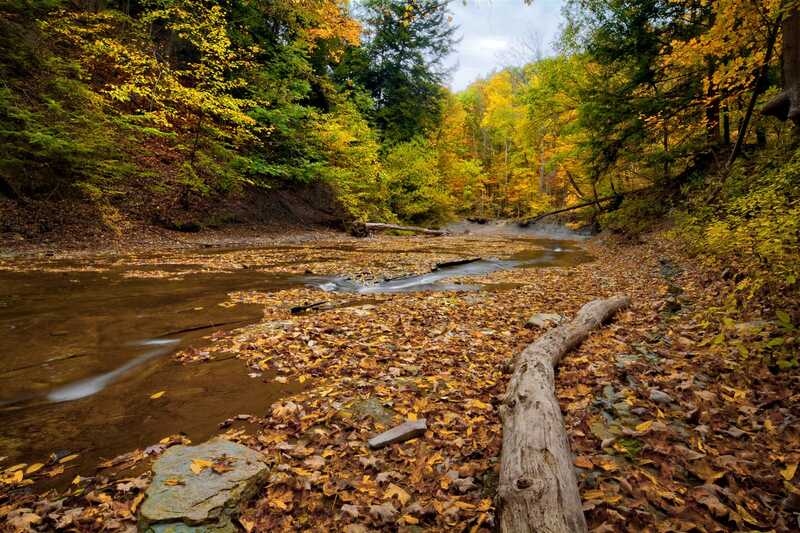 Cuyahoga Valley National Park is an exciting mix of natural and manmade attractions. Park visitors can enjoy the view from sheltered tree-covered hills, ride on the railroad, ski on snowy slopes in wintertime, go to a concert, play golf, or attend an art exhibit. This mix of natural and manmade attractions makes Cuyahoga Valley National Park stand out among other famous US national parks and incomparable to regular wilderness parks. Crisscrossed by roads and freeways, encompassing towns, city parks, and private attractions, Cuyahoga Valley is full of surprises, sights, and activities for the whole family. Located in southwestern South Dakota, the rugged and striking beauty of the Badlands draws visitors from all over the world, making it one of the most visited national parks in the US. 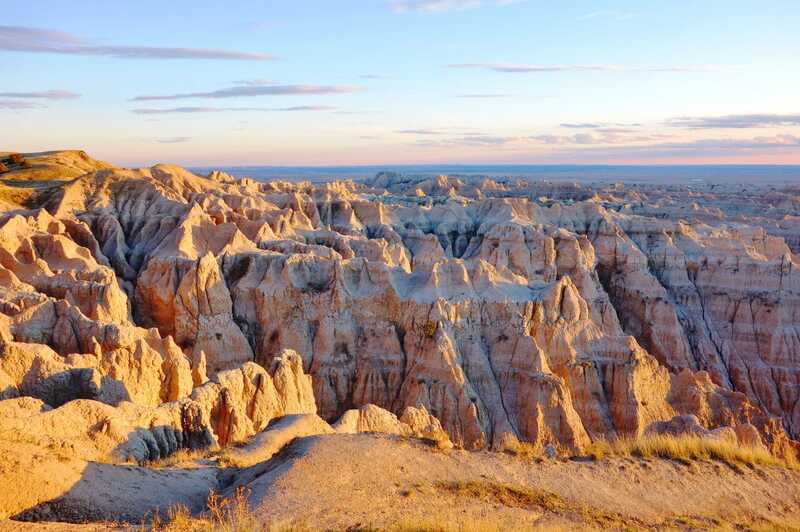 Badlands National Park boasts a maze of canyons and spires, fossilized animal species, ancient trails and monuments, and one of the world’s richest fossil beds. The monuments in the Badlands have stood the test of time, weathering erosion by wind and water, to become a picturesque mishmash of bizarre, deep gorges and pinnacles colored yellow, tan, gray, red, orange, and ash white. The park’s 244,000 acres protect an expanse of mixed-grass prairie where bison, bighorn sheep, prairie dogs, and black-footed ferrets live today, and where three-toed horses and saber-toothed cats roamed long ago. Park officials continue to uncover prehistoric animal bones to this day. Go camping, hiking, or travel the Badlands Loop Scenic Byway to get a glimpse of the wildlife and see the park’s splendor. Race across flat stretches of prairie lands or challenge yourself and climb uphill through the Badlands’ formations. This underrated park is full of rugged beauty that’s easy to fall in love with. Joshua Tree National Park is located in southeastern California and covers a land area a little larger than the size of Rhode Island. 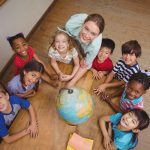 It straddles the border between San Bernardino County and Riverside County, and includes parts of the Mojave Desert and the Colorado Desert. Declared a US National Park in 1994, Joshua Tree National Park is named after the twisted, prickly Joshua trees native to the park. 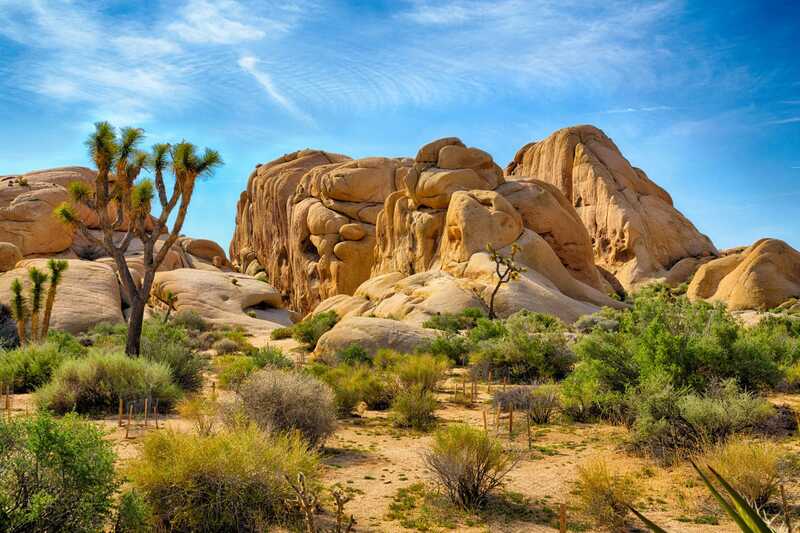 Joshua Tree Park is characterized by large boulders and buttresses, rugged mountains, amazing desert flora, gold mining ruins, desert plains dotted with trees, and a large designated wilderness area. Joshua Tree Park is an alluring haven for artists, hipsters, and those enamored with the great outdoors. 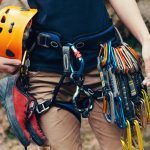 Go hiking, go for a stroll in the Cholla Cactus Garden, or try your hand at rock climbing on any one of the 8,000 known climbs. Your own Old West-style adventure awaits you at Joshua Tree National Park. 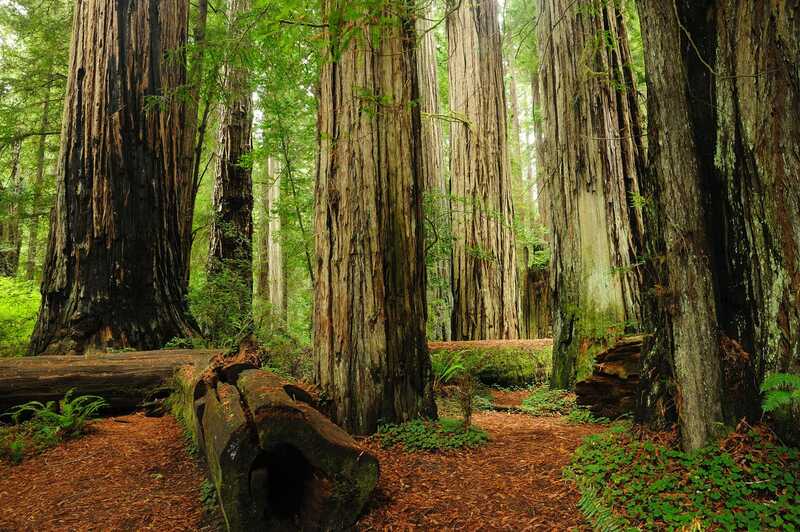 Redwood is home to the tallest trees on Earth; Redwood National Park protects vast prairies, oak woodlands, wild riverways, and miles of rugged coastline. In this stunning preserve and verdant landscape, even the tallest folks are dwarfed by soaring redwoods lined up like skyscrapers. Whether you prefer the comfort of a developed campground or the solitude of a backcountry camp, world-class camping opportunities exist at Redwood National Park. Go hiking or tree-ogling, or follow the freshwater river and access the sandy beach. 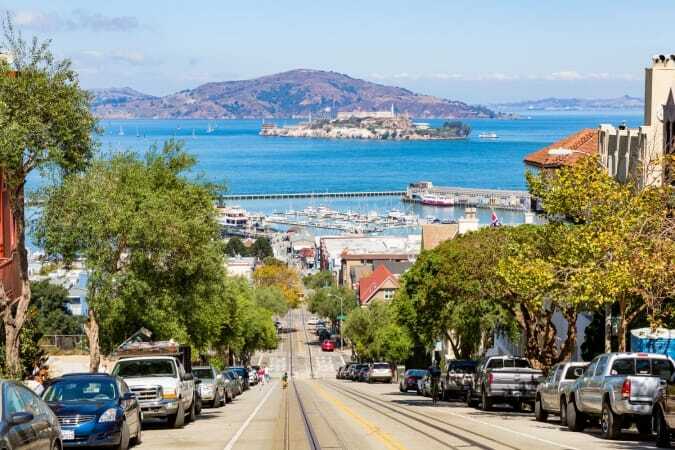 Take a drive or go mountain biking on the scenic roadway Coastal Drive, picnic on a bluff overlook, or scan the sea for whales and sea lions. A perfectly picturesque stay awaits you at Redwood National Park. Saguaro National Park is a 92,000-acre national park in southeastern Arizona that consists of two separate areas: the Tucson Mountain District and the Rincon Mountain District. Though both districts are mountainous, there are a number of differences between the two. The volcanic rocks on the surface of the Tucson Mountain District differ greatly from the surface rocks of the Rincon Mountain District. Uplifted, domed, and eroded, the Rincon Mountains are significantly higher and wetter than the Tucson Mountains, and they are home to many plants and animals that don’t live in the Tucson Mountain District. Aspects of the Rincon Mountains rise to over 8,000 feet and include 128 miles of trails for hiking and exploring. Prior to Saguaro National Park’s creation, it played host and home to Apaches, Spanish explorers, missionaries, miners, homesteaders, and ranchers. 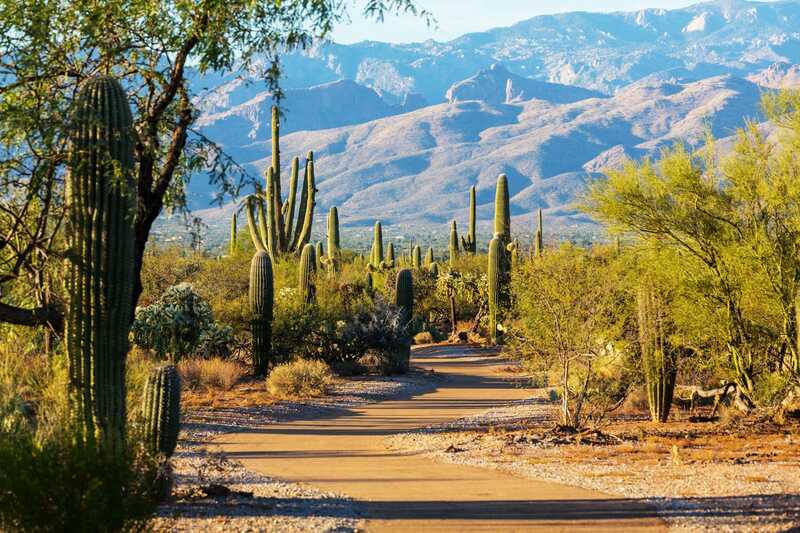 With two parks in one, you’ll get the best of both worlds with a visit to Saguaro National Park. That’s it for our list of the best national parks in the USA. Let stress melt away as you reconnect with nature through wildlife viewing, rock climbing, hiking, biking, or working up a sweat any way you choose. Restore and replenish your energy levels as you sit in solitude by pristine lakes, backpack through gorges, or listen to bird calls. Nature awaits! Happy trails! I want emails from Road Affair with travel updates and marketing. I can unsubscribe any time using the unsubscribe link at the end of all emails. © 2019 Road Affair. All Rights Reserved.